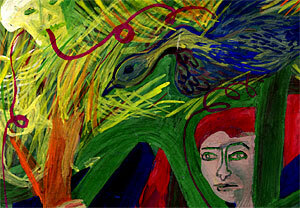 Dimensions (HxWxD): 19.5" x 8" x 0.1"
Lilith in the Tree of Life is an egg tempera piece on acid free rag board. It has a luminous quality particular to egg tempera, which uses the proteins in the egg to form a binder and preservative. I found this centuries old technique a very gratifying way to work. This piece is about Lilith, a demon, or goddess, depending on your point of view, who is mentioned in the Talmud. Lilith is shown here in her "Tree of Life". According to the legend, she takes up residence in a tree to prevent its destruction. Pictured with her are the death skull and the phoenix, to represent her fearsome reputation, which in later years became perverted to include stories about her appetite for infants. Really, she is Adam's first wife. She refused to be subservient to him in the Garden of Eden, and the vengeful God Yahweh, saw fit to curse her to a life of roaming in sorrow. Yahweh then created a more fitting helpmate for Adam, created from his very own body, in the hopes that in that way, they would never become separate. Of course, this myth and others surrounding Lilith, Adam and Eve are far too layered to go into here. You can read more about Adam & Eve and the Garden of Eden in our free E-book, Back to the Garden: Cultivating Love in our Lives. In the bottom of the tree dwells the snake, representative of life everlasting, of renewal and hope, of the treasure to be found within. For deep in our roots, at the base of the spine, lies the sleeping Kundalini serpent wrapped around the pulsing heart, waiting to be awakened by Divine Grace. Once awakened the Kundalini serpent rises through the chakras til it reaches the crown of the head, where Shiva and Shakti embrace in eternal bliss, and, at that moment, the initiate achieves the mystico unio, self-realization, Unity with the Divine. In the center of the tree, in the womb of the Great Mother, we all wait, connected to Life and Death, to be reborn anew. You can see closeup details of the painting below.